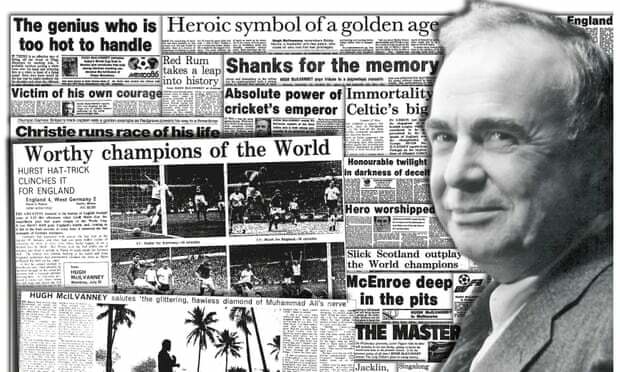 There are sports writers and then there was Hugh McIlvanney. News of Hugh’s passing broke this afternoon, just a week short of his 85th birthday. A proud Scotsman, Hugh was born in the South West county of Ayrshire and had almost six decades in the industry, before retiring in 2016. He started with local newspaper ‘The Kilmarnock Standard’, before moving to the ‘Scottish Daily Express’ and ‘The Scotsman’, but it was his 30 years at ‘The Observer’ and a further 23 years with ‘The Sunday Times’ that cemented his legendary status. and the Hillsborough stadium disaster, Hugh gained a reputation for being THE best. A skilled, talented writer, he had the ability to majestically go past the action in front of him and write about the stories behind as well as sport’s wider significance. Away from the newspapers, Hugh wrote numerous books, primarily about boxing and football and also wrote and narrated tv and radio documentaries including one in 1970 about George Best. Often described as Britain’s greatest ever sports writer, he received numerous awards during his career and was the first, and for some time, only sportswriter to be Journalist of the Year. He was awarded the OBE in 1996 and was inducted into the International Boxing Hall of Fame. Although I grew up in an era where McIlvanney was already well established, I quickly learnt that he was first among equals; someone to respect and admire and to be glued to when he spoke or wrote. I’m sure that over the next few days many words will be written about him, with anecdotes aplenty and I look forward to those reflections. Although a sad time for so many, it also allows us to revisit and reflect on the work of a true leader in his field and it’s not every day you get to do that. Make sure you read the old articles, they are something else. RIP Hugh. Loved your tribute to a true sports writing legend, Aiden. Growing up I was a bit of an anorak and kind of idolised TP McLean and DJ Cameron- true NZ legends of sports journalism. But I heard about Hugh McIlvaney also. And a bit later on I got to read some of his work- such effortless prose. Close to a genius in his field, really. Here is a brilliant McIlvaney quote for you: ‘people talk about Newcastle as a sleeping giant. They last won the championship in 1927 and the FA Cup in 1955. They make Rip Van Winkle look like a catnapper’. Cheers Paul, that’s a cracking quote, so typical of Hugh. I rewatched that George Best documentary last night, apart from reading his work I could listen to his voice all day.